In an A/B test email, only the B variation can be deleted. To delete variation B of your A/B test email, you'll need to cancel the A/B test. 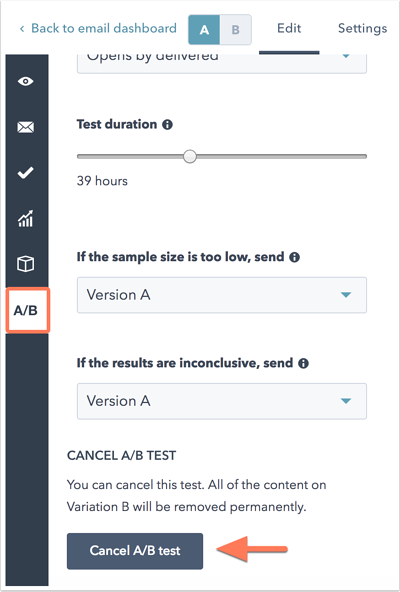 Hover over the A/B test email and click Edit. On the left side of the content editor, click the A/B icon. At the bottom of the left slide-in panel, click Cancel A/B test. In the dialog box, click Delete B variation. This will permanently remove the content from variation B and reload the email editor with the contents of variation A only. To confirm the cancellation, click on Delete B variation.